I was in my local Apple store last weekend looking for a wireless charging unit. I couldn't see it on the shelf, so asked the shop assistant if they had any in stock. He didn't answer. I stood next to him awkwardly for a while, and asked again. I then saw a notice up on the wall saying "If you ask us for something and don’t get an answer, please assume we don’t have it". OK, so that's BS - I made it up. Yet I see companies all the time posting "If you don't hear back from us, assume your application has been unsuccessful" on their career pages. I've also seen some who send this as an automated reply to a job candidate. It drives me wild. Actually, absolutely livid (for those old enough to remember, it's at 1:03 here). But because it makes things easier for you as a prospective employer doesn't make it the right thing to do. Call or email unsuccessful candidates. Have the balls and respect to tell them they're not a fit for your company, and the consideration to tell them why. It doesn't need to be as long and convoluted a conversation as the Game of Thrones plot line. Just a couple of respectful sentences with real reasons, preferably with a little more detail the further down your process the candidate has got. The more time the candidate has invested in applying for you, the more care you should take in telling them why they didn't make the cut. I've been in recruitment scenarios where genuine career advice has been shared, so even though it's been a rejection, there's been value in the process. I once pitched for work in a company where the person making the decision was someone who applied to work in my team a couple of years previously, but whom I’d decided wasn’t a good fit for us. Worse, I didn’t even remember him or the interview when I met him as a prospective client, and he had to remind me! Embarrassing moment. An awkward nanosecond which felt like an hour. My bad (I have poor facial recognition abilities, but that’s no excuse). But then he went on to make a point of telling me that the way we’d handled his application, and especially how we’d handled the conversation where we told him he wouldn’t be moving further with us, was a key factor in why he’d sought us out for this work. We won the work, and it was a decent 7-figure size project. You’ll be amazed where it comes back to you. But even if it doesn't, do it simply because it's the right and respectful thing to do. And by the way, job applicants, before you get carried away and start giving me digital fist-bumps, if you’ve ever emailed a plain CV without a cover letter to apply for a job, or a standard CV with a standard cover letter that didn’t take into account exactly who you were applying to and what role you are applying for, or just told your prospective future workplace to check out your LinkedIn profile, then you're just as guilty. 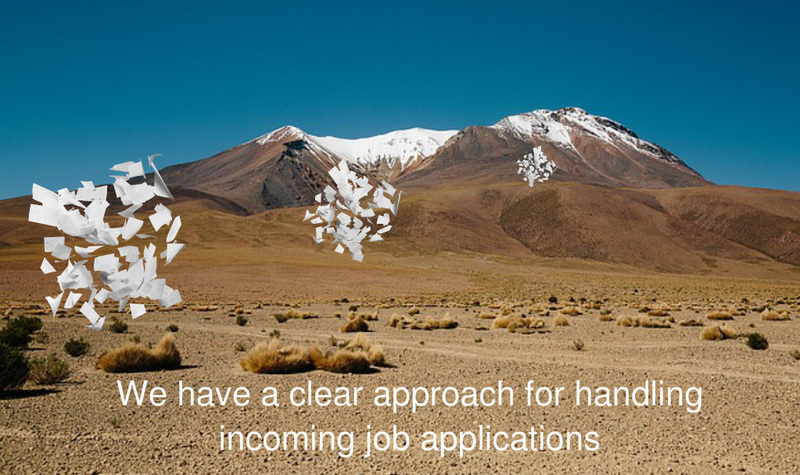 If you can’t be bothered to take the time and care to send a decent application, and go prepared for an interview, then you probably deserve the "assume you've been rejected" reply. Some respect both ways, especially when it's about life decisions, goes a long way. Recruitment is one part of the Consultancy Lifecycle process we cover across two modules within our Values-Led Consulting framework and programme. It is delivered by our founder, Iyas, based on his experience while growing a consultancy and Full Services Agency which was sold for £42m.